Foundations and Footing the Building Block for a Marvelous Building! For every building, structural integrity starts with foundations and footings. Concrete foundations and footings are the most common and type. for your concrete construction needs. Footings can be relatively shallow concrete installations that transfer the weight of the building above to the bearing soil. Spread footings are most common for residential work. In all cases footings must be placed so that they rest below the frost line. In Alabama and the rest of the Southeastern U.S. this varies based on latitude and the local elevation. Another type of common footings are pilings. Pilings are used to reach more deeply through unsuitable soil to bearing soil or bedrock. They are typically used for larger structures with higher dead loads. 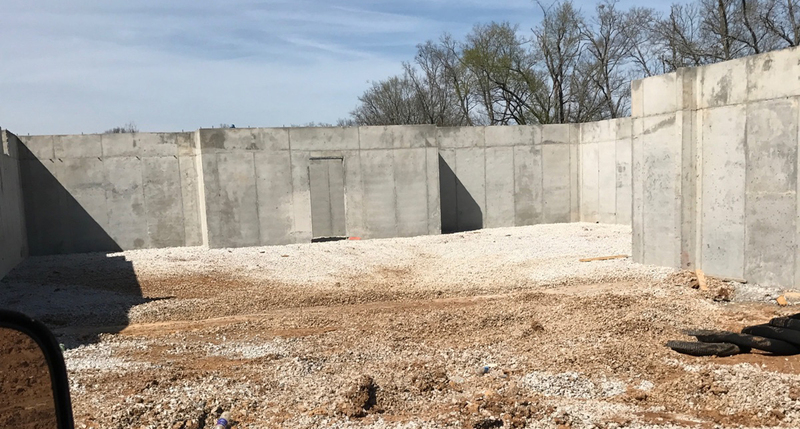 Forms are placed in drilled holes, steel reinforcement is placed and then concrete is poured in lifts with mechanical vibration to ensure bonding. We are familiar with the types of footings available and their installation. Along with footings, foundations are the entire system upon which all construction begins. Different types of slab foundations in conjunction with footings or with haunched integral footings are what we do. The slab forms the basis for flooring, is the barrier between soil, groundwater, etc. and the interior of the building. Pouring slabs with proper moisture protection, insulation, reinforcement, placement, finishing, is an art. This is what we do.